Would you like to get email updates from Rebeckah's Blog, plus, receive special discounts to use in Rebeckah's Store and get FREE Crochet Patterns monthly? Sign up now to get your free gentleman pattern today, and start receiving monthly newsletters from Rebeckah's Treasures! Newsletter Freebie Lady will be available later this year! 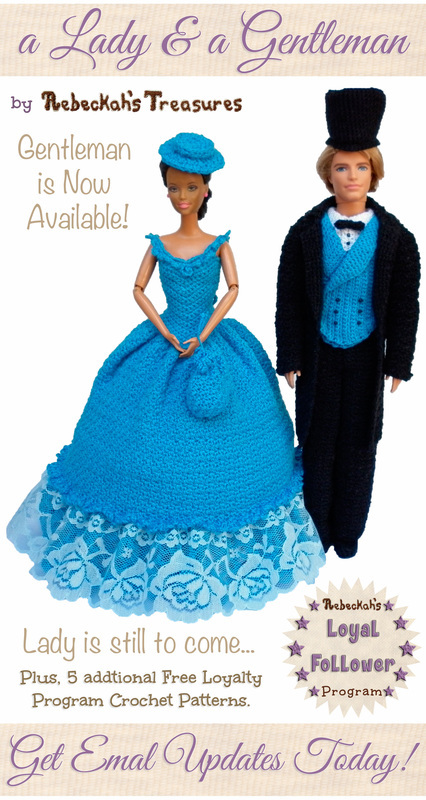 Once your subscription is confirmed, you'll receive an email to grab your free copy of the fashion doll gentleman crochet pattern pictured here. One week later, you'll receive an email to grab 5 additional free crochet patterns of your choosing from the List of Loyalty Program Patterns! As soon as the Lady crochet pattern is ready, you will get an email with a link to download it. Newsletters are sent out the first and third Mondays of each Month. They include updates, special discounts, a free loyalty program pattern code, blog highlights, and general news about Rebeckah's Treasures.